The Four-Diamond Omni San Antonio hotel captures the true spirit of Texas with impeccable service and charm. The hotel offers complimentary airport shuttle service. Our 326 guest rooms are attractively furnished and offer dual phone lines and voice mail. Bolo's Restaurant features diverse and exciting cuisine that has been described as true Latin American dining while the lobby bar provides a relaxing environment with live piano music. On-site leisure amenities include a heated indoor pool and an outdoor pool with lap swimming area plus an indoor hydrotherapy pool and an outdoor whirlpool and full service spa. Complimentary local shuttle service is available within a 5-mile radius of the hotel. Hotel is 100 percent Smoke Free. Welcome to Omni Hotels and Resorts. 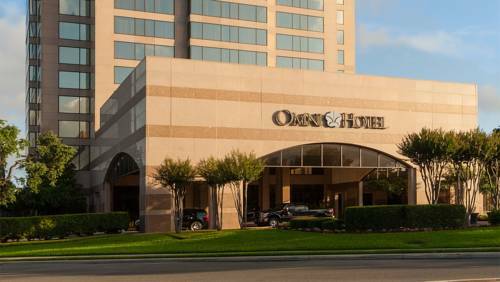 The Omni San Antonio hotel is located in the Northwest business area of San Antonio known as the Colonnade. The hotel offers easy access to area businesses as well as shopping and entertainment venues. Six Flags Fiesta Texas is just 5 minutes away while Seaworld San Antonio is a 20 minute drive. Nearby freeways allow guests to visit the Texas hill country and the Shops at La Cantera and the areas many historic sites including the Alamo and La Villita and the enchanting Riverwalk. Complimentary airport shuttle service is provided while local area shuttle service is available within a 5-mile radius of the hotel. The award-winning Bolos Rotisserie Grille turns dining into an art form. Acclaimed as one of the highest-rated restaurants in San Antonio Bolos features diverse and exciting cuisine that has been described as true Latin-American dining. Open Daily from 0600-2200 hours. Features live piano music Tuesday to Friday from 1800-2300 hours. Guests can enjoy specialty cocktails and other beverages complemented by a Latin American menu. Open Daily from 1400-Midnight. Located on the lobby level and available 24 hours a day.Self-service facility requires a credit card for access to some services. Tower with observation deck and restaurant and 4-D theater ride. An amusement park for special needs. City Center is not within walkiing distance to the hotel.There is no free transportation to city center. There is no public transportation adjacent.